I don’t know why, but before the summer holidays I was attracted to very tough history books sold to a YA readership, and they were both incredibly hard to read and incredibly necessary to read. The tragedy of Baltic massive forced exile to Siberia was one, but this one is another (I stopped after that and chose some more escapist reads). 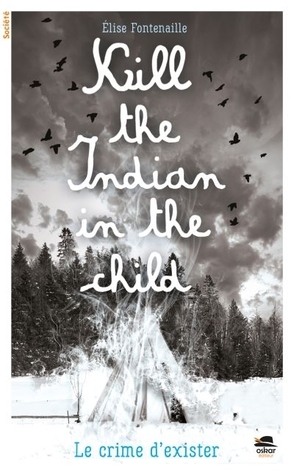 This novel inspired by a true story deals with the massive abuse against aboriginal kids that went on in Canada for decades, nearly for a century, approved by the state and religious institutions that ran these prisons called boarding schools. The novel is told by 11-year-old Mukwa, a native Ojibwe boy, who is forced into one of these schools. His parents can’t keep him at home any longer and are comforted by the promise of an education. Mukwa arrives at St. Cecilia, a boarding house run by nuns whose objective is to “kill the Indian in the child” (as is the title of the book, a true sentence from back then). I won’t go into details, but Mukwa’s life in this “school” is nothing short of hell, and he soon decides that he will run away, at all cost. This is a very tough read, for adults and young people alike. I’m not sure I’d recommend this to anyone under 16. I knew about this tragedy when I visited British Columbia in 2006, and I didn’t realize back then that the abuse had been so generalized and so long: 150,000 kids went to these schools and suffered all kinds of violations and abuse for the sake of “saving their souls” and making them “civilized”. An estimated 30,000 kids died, and the last school closed only in 1996. The writer, who has written several books set in Canada and Vancouver (I’d discovered her with this novel), didn’t invent much, sadly, as she took inspiration from the death of Chanie Wenjack in 1966. I hope that Canadian readers have access to such books in French and English. It is important that young (and not-so-young) readers have access to these pieces of information, and the postface with lots of facts and dates was a useful addition to the personal harrowing narrative.